Barn cats are as much a part of racetrack lore as good-luck horseshoes, and in some barns, the reality lives up to that idyllic image of a cherished feline, prowling the barns for prey, soothing the horses, ruling the roost. Some backstretch cats are beloved and spoiled rotten, traveling from track to track with trainers and staff. Jimmy Toner’s Mademoiselle (recently featured in Newsday) heads to Florida from Belmont, and up to Saratoga; Rusty and Sarah Arnold’s cats have frequent traveler miles in the Sunshine State, the bluegrass, and the Adirondacks. But they are the lucky ones. About two dozen cats live on the Oklahoma backstretch all year round, making it their home long after the human and equine denizens have left for warmer climes. Sometimes, they are joined by cats left behind after the summer meeting. 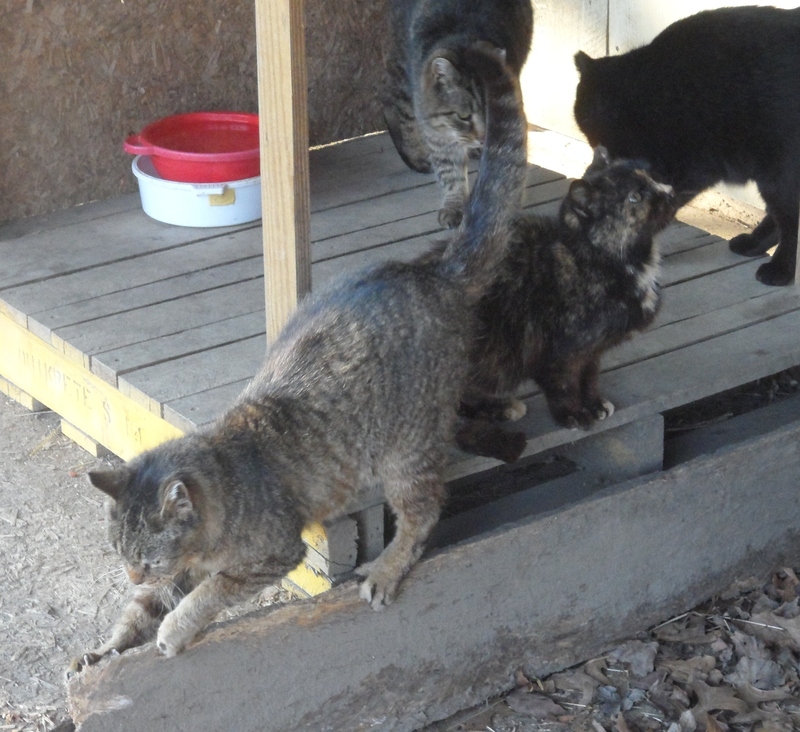 A trio of committed caretakers makes sure these cats are healthy and well-fed. Michele Jennings goes to the Oklahoma every day all year round to feed them; she also traps newcomers that need to be spayed or neutered, and takes in those that are ill, often to her home. Quaintance House Animal Protective League, in nearby Greenwich, spays and neuters the cats and provides medicine and care. An independent clinic, its practice goes well beyond the racetrack cats, but without that commitment, the program couldn’t survive. The Moore Foundation, established by Thoroughbred owner Susan Moore, funds this work. Relying on donations and the generosity of Susan and her husband John, The Moore Foundation covers the vast majority of the expenses incurred by Jennings and Quaintance House. You can read more about them and the program in articles at The Saratogian and Brooklyn Backstretch (with photos and video). Tonight at the Inn at Saratoga, Quaintance House is holding a fundraiser to support its work. Tickets are $45 for an event that goes from 5-9 pm, featuring a wine tasting by Crush & Cask, a beer tasting by Olde Saratoga Brewery, a light buffet, live music, and a silent auction. Attire is casual, attitude festive. If you can’t make it, perhaps you’d consider contributing to a matching funds campaign supported by John Moore, who will match all donations up to $2,500. It costs about $2.50 a week to feed each cat, $175 to spay the cats who are all too frequently left behind after summer racing. The annual cost of the program is about $12,000, funded nearly exclusively by The Moore Foundation; recent budget cuts reduced NYRA’s contribution to the program to $2,500 a year, but you will find auction items donated by NYRA at tonight’s event. Later in the meet, Quaintance House will be at the track’s Community Outreach booth by the jockeys’ silks room (date TBD). Through their efforts, Jennings, The Moore Foundation, and Quaintance House have created a stable, healthy environment for the cats. Feral cat colonies are known to keep rodent populations down, and when colonies are stable, interlopers are few; it’s really hard for a new cat to break into an established colony, which makes life even more treacherous for the cats who are intentionally or inadvertently left behind. They don’t know how to fend for themselves, and the colony cats frequently don’t let them eat. In the terrible weather of last winter, one poor terrified cat didn’t make it. He didn’t have the survival skills to be an all-weather outdoor cat, and he was too scared to let himself be caught by Jennings. If you’re a trainer and you’re reading this, please let us know if there are cats around your barn that need to be cared for; let us know if you can’t find your felines when it’s time to leave. If you’re an owner, please pass this on to your trainer. And if you’re just a feline-loving race fan, or a horseman who wants to help, maybe you can spare $10, which will feed a cat for a month. You can make your gift to the cats at The Moore Foundation, noting that it’s for Quaintance House. You can also make a sustaining, monthly gift that will support a cat year-round. Do you work for a feed company or shop at wholesale clubs? A couple of cases of canned food or big bags of dry go a long way, and those donations are tax-deductible. If you can’t donate, perhaps you can spread the word about tonight’s event and the matching funds campaign. $2,500 is a lot of money, but it represents less than 25% of what it takes to feed and care for the cats. Your generosity is appreciated, by me, by Jennings, by the Moores, by Quaintance House, but most of all by the cats you’ll be helping. Thanks to Natalie Voss for her recent story about the backstretch cats, and to Michael Veitch for his.